My self imposed painting challenge for September has been to paint up enough models to enable me to field two fully painted 35 point Khador lists. The reason for that was so I could play at a tournament I went to on Sunday. I admit I haven’t had chance yet to take pictures of my models, so that’ll mean another blog post is still to come, this post is more of a mini tournament report. 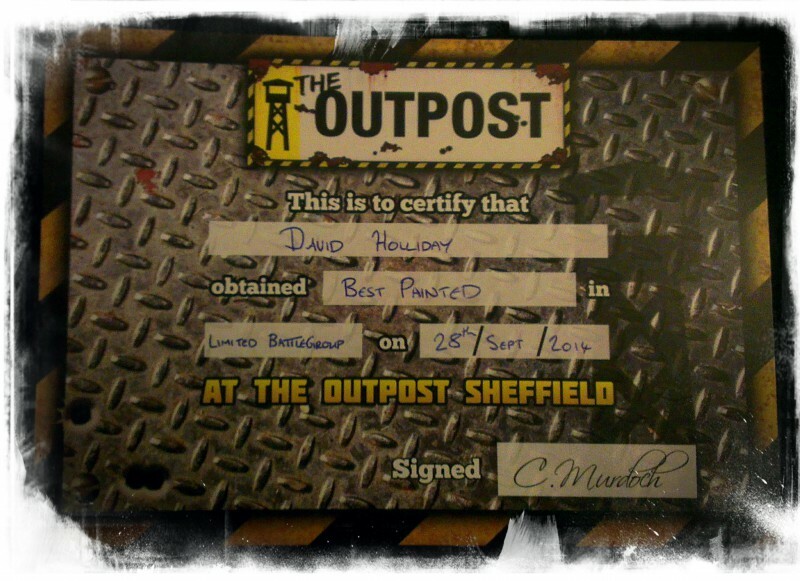 So the tournament was held at The Outpost in Sheffield. The venue consists of a well stocked shop with gaming tables down the centre and a small hobby area at the rear of the shop. The shop has a mezzanine floor above it full of gaming tables, big enough for 12 games of Warmachine. Space is at a premium like most gaming venues in the UK, so you gotta be prepared to be friendly if you need to squeeze past someone lol. The terrain on the tables was decent enough and functional, it also matched the gaming surface. So there was snowy terrain on the white gaming table, desert terrain on the sand coloured table etc. I think that is something quite important for a gaming venue to have well thought out terrain that adds some visual appeal too. The lunch included with the event cost was good, the Outpost had an arrangement with a Mexican food place just down the road (my first ever burrito, yes yes sheltered life growing up in a back water town an all that). The staff there were friendly and approachable and if there were any hiccups in the running of the event then the organisers dealt with it so well I never noticed (although I am far from a seasoned tournament attendee). There is only one thing I could fault them on, the event information said that zones flags and objective markers would be provided but on the day there was a shortage of large bases for objectives (hardly worth mentioning is it, I guess I am just a little miffed I didn’t take this with me lol). So will I be going to another Outpost event? I am definitely going to try. Would I recommend the place to my friends? Yes, absolutely. Having said that an event is nothing without participants, and the guys that I played against and chatted with throughout the day were excellent. I think over the course of 4 games there was only 1 rules query we got a ruling on, and that was because neither of us actually knew the rule rather than disagreed over the rule. It was a friendly and fun atmosphere all day, even at the end of the day when you get players all tired out. That in itself was pretty good for me, as I had had a 2hr drive to get there anyway, so i was one of teh pretty tired ones lol. So I managed to take two fully painted lists which I was really pleased to be able to do. Sadly my gaming was a let-down, as you’ll see in a minute, but i’ll try to be brief so not to bore you too much. I did do my best to be mindful of scenario while looking for the assassination. In my first two games scoring the most CPs but that turned out to be my downfall in the second game. I can also hear you laughing…yes there are Kossites in my lists. The Kossites were painted, and I wanted to take fully painted lists. Here is a mini report on each game. This is the 3 flag scenario where one of the flags on a flank disappears at the end of the first round. I picked my Butcher list and we had both set up fairly centrally with me perhaps advancing more headlong into the centre of the table on the first turn. Having gone up 1 CP on scenario I tried to clear out some Death Marched Bastions with a charge from Butcher, unfortunately I had misjudged the distance and Butcher only made it into melee with 1 of the 3 remaining Bastions. Having killed that Bastion I then cast Iron Flesh on myself at double cost thanks to Reznik2’s spell Lamentation. The vengeance move and attack from the last two Bastions dealt a massive amount of damage meaning that only one attack was needed to finish Butcher off when the unit activated later that turn. Believe it or not the Kossites were useful for reducing the Choir by half, tying up Eiyrss for a turn, preventing a Crusader claiming a CP. In the end they pulled Reznik2 into charging the unit to clear them. This scenario has two asymmetrically located flags on the table, the closest flag is friendly the other is an enemy flag. You get 1CP for dominating your own flag or controlling the enemy flag, and 2CPs for dominating the enemy flag. This time I picked my Sorscha list, no other tactical genius went into this decision other than I had yet to play it. Again we both deployed fairly centrally and both our first turns were mostly spent advancing cautiously. Silly positioning/lack of protecting my caster to get the first CP on my second turn enabled a charge from an Ignited Vilmon to one shot Sorscha. All this happened in just over 18 minutes giving my opponent the fastest caster kill of the tournament. Ignite on Vilmon took his MAT to 11 and P&S to 17. I thought Sorscha was safe on DEF 18 having cast Wind Rush. I had made the closer Bastions stationary by using Freezing Grip on them, so I had thought I had nullified the primary threat to her. Especially having moved back into a wood with Wind Rush to dominate the flag for 1CP. I just didn’t see that charge lane open, doh! Maybe I had just fixated on the Bastions after they had creamed an Iron Fleshed Butcher1. The charging weapon master only needed a 7 to hit, and then rolled 6, 6, 5, 4 I think. More than enough to kill Sorsha and her paper thin ARM 14. There is a rectangular zone in the middle of the table with a friendly and enemy objective on oposing corners. You have to destroy the enemy objective to be able to control or dominate the zone. Scenario didnt come in to this game, neither objective was destroyed and I never got to the zone at all. I picked Butcher because i thought that list would be better able to deal with 3 heavy beasts (Bronzeback, Gladiator, and Molik). Josh had set up with infantry on my right side and beasts on the other. I mirrored that with my Iron Fangs vs his Nihilators, and my jacks and the Great Bears opposite the beasts. Issues with bunching up my models on the right flank because of some difficult terrain meant that after they dealt with the Nihilators on the right flank they could not get back across to protect my left flank. I had also moved the Devastator across to open up against the Nihilators too adding even more to the traffic jam. The left flank had his beasts (Bronzeback, Gladiator, Molik) facing my Juggernaut, Butcher and the Great Bears. After forgetting about Admonition on Molik and letting him get away I left a hole in my left flank that enabled his assassination run. An Abused Bronzeback trampled up next to a zero camped Butcher and squished him with bought attacks. The Kossites reduced the Beast Handlers numbers, and tried to tie them up. My opponent was on the bottom table because including the games played during the tournament he had a grand total of 5 games under his belt, imagine that I had done so badly at this event that I was on the bottom table at the end of the event playing someone completely new to the game. But I had enjoyed every game, well I could have done with one game lasting longer than 18 minutes 😉 . As I had played Butcher last game I picked Sorscha to even things up. The scenario didn’t mean much this game, I used my IFP to take out his jacks over a couple of turns, while Orin, the Eliminators and Black Ivan dealt with the Highshields. Sorscha had one assassination run on Ossrum, but was struggling to damage him fully camped, so Wind Rushed back. The gap plugged by IFP whole did a massive single CMA the next turn to finish off Ossrum. The Kossites took out the Horgenhold Artillery. I do not actually know my final event standings, but I imagine I was next to last 😉 If any of my opponents actually read this, I would just like to say thank you for my games, I enjoyed them all. …and after the effort I had gone to over the last few weeks, that made my day! This entry was posted in Waffling Verbage, Warmachine & Hordes. Bookmark the permalink. I absolutely love write-ups like this. Sounds like a couple rough games, but you had a great time still and that’s just the best. I’ve found that the local community here has just been a joy to play with, even if I’m getting beat in heavily. It’s weird thinking that a game about destroying each other can be so friendly, hah! Very much deserved and earned with the painting award. You’ve been a machine this past month with that stuff. Thanks for keeping us updated on the progress!